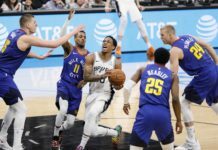 On Wednesday afternoon at the Pepsi Center, the Denver Nuggets held a press conference to formally introduce their 2016 NBA Draft picks to the city of Denver. 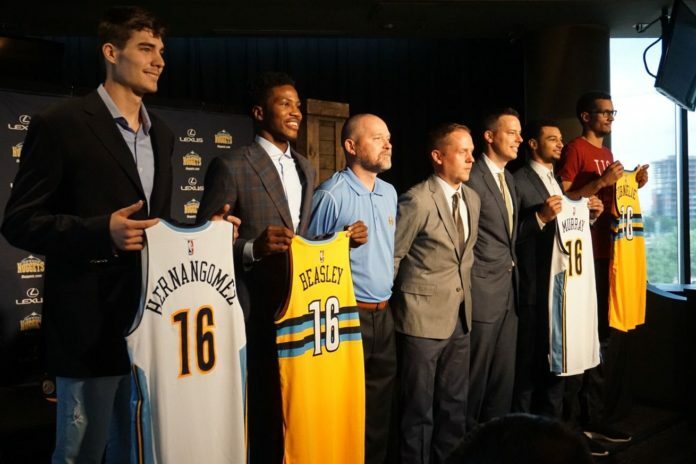 Jamal Murray, Juancho Hernangomez, Malik Beasley and Petr Cornielie were all there, along with owner Josh Kroenke and head coach Michael Malone. Here are some of the highlights from the press conference. With all four players officially being introduced as NBA players for the first time, it’s not surprising that there was excitement in the air. And you could tell, due to their big smiles, that the feeling isn’t going away any time soon. “I want to say thank you to everybody, I’m very happy to be here and I’m excited to be here if you can’t tell.” Juancho Hernangomez said. Tim Connelly has done an exceptional job thus far. He and the front office staff have been working relentlessly to reshape the roster and organization, especially through the draft, and it’s paying off. The Jamal Murray draft pick was a testament to this. Murray averaged 20.2 points, 5.2 rebounds and 2.2 assists during his freshman year under John Calipari at the University of Kentucky, and now he will be bringing his sharpshooting talents to the Mile High City. 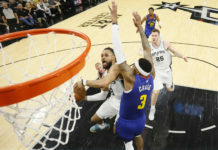 Similar to last year, with the selection of Emmanuel Mudiay, the Denver Nuggets played the waiting game, and again it proved to be the right move, as they saw “their guy” fall into their laps yet again. Great assurance from the general manager of the Denver Nuggets, but Murray was just as confident. Juancho Hernangomez has a smile that makes you smile. 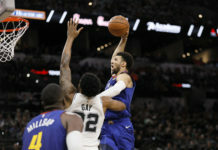 While it’s likely that the 15th-overall selection won’t play this upcoming season, there is plenty of hope that Hernangomez can provide the long-term spacing the Nuggets have been looking for at the power forward position. With a 6-foot-9, 225 pound frame, he can be used in pick-and-pop situations, which opens up the floor for Denver’s guards to attack. Hernangomez averaged 16.3 points and 9.7 rebounds per game while playing in Europe last year and was one of the premier players at the highest level of European basketball. He provides the necessary balance that the Nuggets need, and he’s ready to start playing in Denver, whenever that ends up being. Simply put, Malik Beasley works hard. “He may be the hardest worker I’ve had in 30 years,” his high school coach, Drew Catlett, said. And that’s exactly what he plans to do with the Nuggets. The Denver Nuggets picked up a gem with the No. 19 pick, and he couldn’t be more excited to be playing in the Mile High City. "We're going to work together and compete to make this program better." He is an athletic big man that needs to develop, but that’s okay, because he will surely have the time, as it’s unlikely Cornelie comes over to the NBA next season and will likely spend at least another year developing in Europe. And like the rest of Denver’s draft class, he fulfills the need they looked to fulfill most this offseason: shooting. Although it may be a year, if not more, before Cornelie suits up for the Nuggets, he was ecstatic to be here while he could. "I'm happy to be here. I really am." Versatility, shooting and character were common themes amongst the Nuggets’ crop of rookies. And while that all sounds good on paper, coach Malone now has to find a way to implement these pieces and find success on the court. The next step for the drafted players will be to prepare for the NBA Summer league, which begins in July.